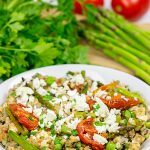 Looking for an easy weeknight meal? 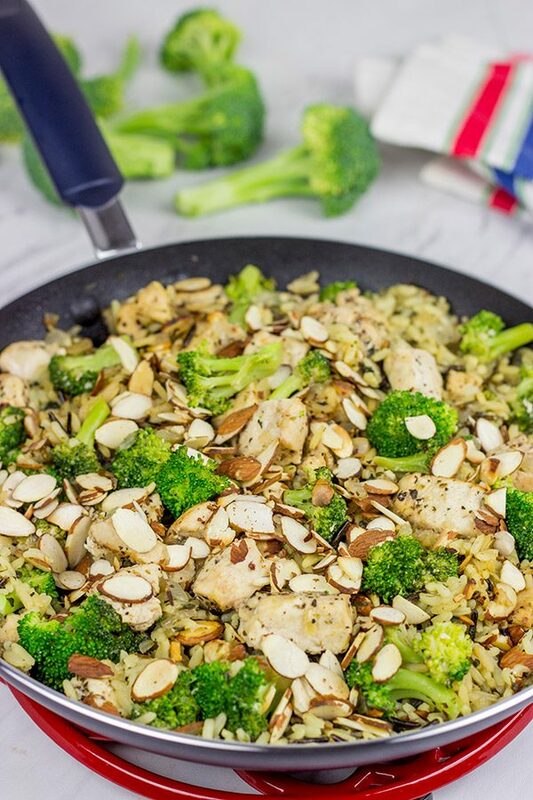 This Chicken, Broccoli and Wild Rice Skillet is the perfect solution! This just in: Santa can’t live on cookies and milk alone! Trust me, he’s tried. But Santa has lots of shopping to do and presents to wrap. And those pesky reindeer always come and drop a toy at Santa’s feet right when he’s in the middle of a project. Yup, the holidays are a hectic time of the year for everyone…including the big man in the red suit! All joking aside, I do love baking for the holidays. 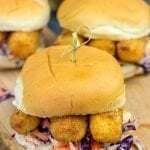 But after a few days of indulging in holiday cookies and treats, I find myself craving wholesome food again. That’s where this Chicken, Broccoli and Wild Rice Skillet comes in play. This recipe is seriously one of the first entrees I ever learned how to make once I moved out on my own. I’d make this meal at least once every other week. It’s delicious and easy, and it reheats well, too. Bonus points when dinner involves easy leftovers, right? In fact, I’ve had several guy friends come to me over the years and ask for easy dinner recipes. 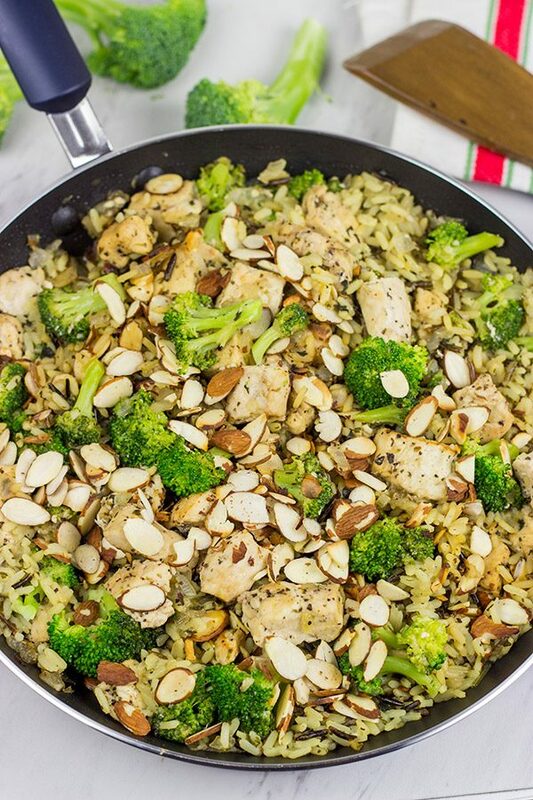 I always give them this Chicken, Broccoli and Wild Rice Skillet recipe. One of the guys made dinner for his girlfriend for the first time…and this skillet recipe was it. They got engaged recently, and I like to think this recipe was the reason why. Just kidding, of course! But the recipe is a winner, and it’s also Santa-approved! Speaking of Santa, have you finished all of your gift shopping this year? Amazingly, 30% of folks say they don’t finish their holiday shopping until Christmas Eve. I’m definitely not in that 30%! I used to work in a kitchenware store, and Christmas Eve was always one of the busiest days of the year. For the record, 37% of folks under the age of 30 wait until Christmas Eve to finish shopping. If you’ve still got some names to cross off on your list, then might I suggest some new cookware? I recently had the chance to try the T-fal Color Luxe nonstick set, and I was really impressed! The cookware is lightweight, and it performs beautifully on the stove. The nonstick surface on the pots and pans is reinforced with titanium to increase durability and performance. As I’ve mentioned before, Laura is a metallurgist. When I was unpacking this T-fal Color Luxe set, she was busy ready about the titanium coating. Ah, life with a scientist! Everyone needs a couple of good nonstick pans, and I found that these performed quite well…and clean-up was a breeze, too! One of the coolest things about the T-fal Color Luxe line is that the pots and pans all have a patented T-fal Thermo-Spot built into the bottom surface. The Thermo-Spot changes colors to let you know when the pan has reached optimal cooking temperature. How cool is that? Aside from the performance, I also found the soft-touch handles to be really nice. The pots and pans were comfortable and easy to use, and they also come in a variety of fun colors! 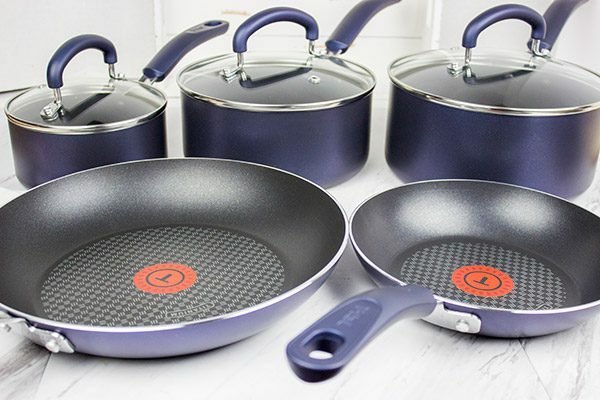 I personally like the Sapphire Blue (shown in these photos), but the T-fal Color Luxe line also includes Ruby Red and Amethyst Purple. All of the cookware in this set is dishwasher safe and oven safe to 350°F. So if you’ve still got some folks on your holiday list, give the T-fal Color Luxe line a look! The set can be purchased on Amazon or in a store near you. The T-fal Color Luxe Nonstick 12-piece Set includes: 2 frying pans, 3 sauce pans (with glass covers), 1 Dutch oven (with glass cover) and 2 nylon cooking utensils. 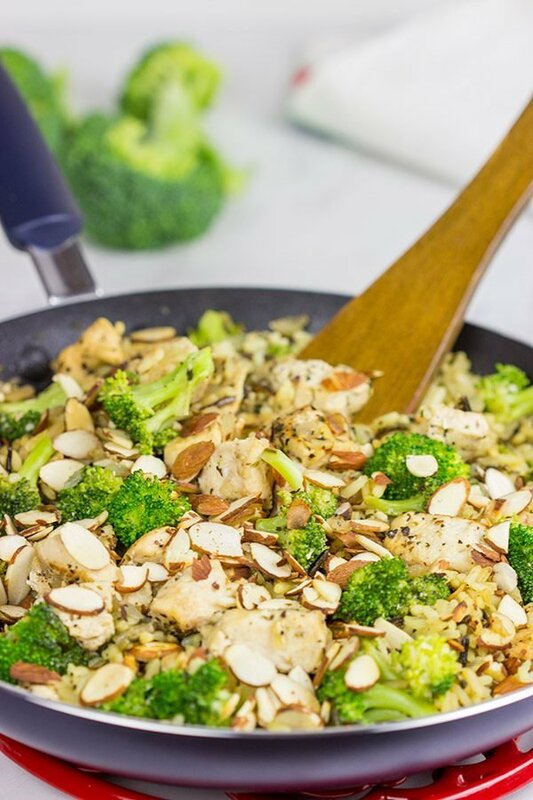 If you’re looking for an easy meal to balance out the holiday baking, then I highly suggest this Chicken, Broccoli and Wild Rice Skillet. We even served this meal directly from the skillet…which meant one less pan for me to clean! After all, there’s still presents to wrap and those reindeer still want to play ball. Enjoy the season, my friends! Want to win (yes, win!) 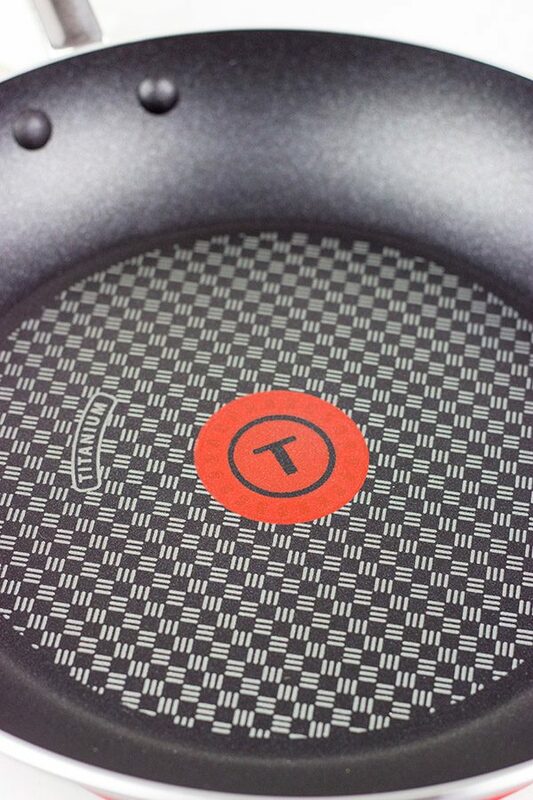 a set of this T-fal Color Luxe Nonstick cookware? Look for a post on my Instagram this Friday with more details! Using a small saucepan, add the uncooked rice and stock; stir. Place over medium-high heat and bring mixture to a boil. Reduce heat to medium-low, cover and simmer for 20-22 minutes, or until stock is completely absorbed. Meanwhile, using a large bowl, add olive oil, onions, chicken, Italian seasonings, salt and pepper; toss until well coated. Place a large skillet over medium-high heat. Once hot, transfer chicken mixture into skillet. Sauté for 5-6 minutes, or until chicken is no longer pink. 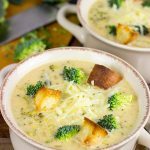 Add garlic and broccoli and continue cooking for 8-10 more minutes, stirring often, or until chicken is fully cooked and broccoli is tender. 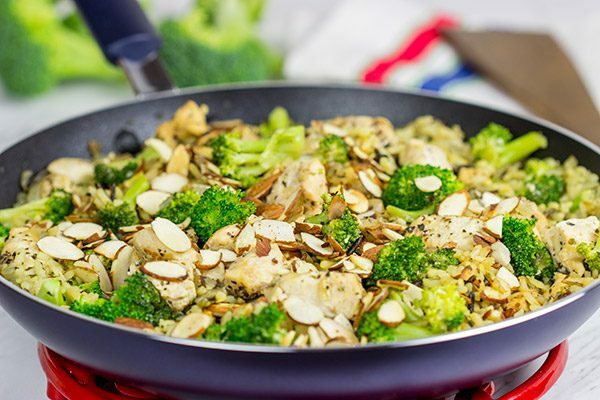 While broccoli is cooking, place sliced almonds in a small skillet and toast over medium heat, stirring constantly, for 2-3 minutes, or until almonds begin to smell fragrant. Add the cooked wild rice, toasted almonds and soy sauce to the skillet; stir until well combined. Serve directly from the skillet for an easy, weeknight meal. 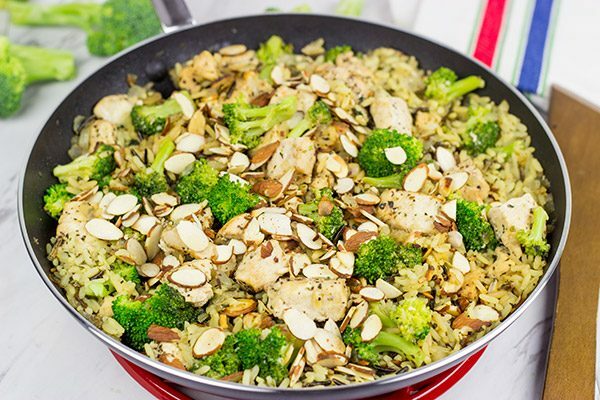 This Chicken, Broccoli and Wild Rice Skillet post was written by me on behalf of T-fal. 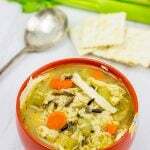 This is just the kind of recipe I need for the next few busy weeknights as we scurry around getting ready for the holidays! So many flavors I love in one pan! Oh gosh, this time of the year is so fun…but it does indeed get busy! Easy weeknight meals are a must any time of the year, but especially leading up to the holidays! 🙂 Thanks so much, Marissa! Hahaha…thanks so much, Christina! This meal is gonna come looking for you. 🙂 Like you, I love desserts. It’s one of the best things about the holidays! But after a few days of desserts-all-day, I kinda need something green. And not green sprinkles on my cookies. Haha! This is a quick and easy meal that I’ve seriously been making since I learned how to cook. I hope your week is going well, my friend! Exactly! Cookies, eggnog, and other delicious treats are great, but there’s always the day when you realize you cannot handle desserts anymore, and you need a break. 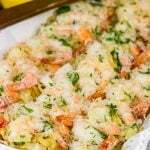 Moreover, you realize you cannot see all those sophisticated festive dishes, and all you’re craving for is something absolutely light, simple but hearty. Like this bowl full of veggies and chicken. So, good point for predicting the things, David (But I’m not done with cookies. Not yet)! Yeah, I’m starting to get to that point of dessert-overload. I never think it will happen, but then it does. The chocolate cookies and Danish cookies and other sweet treats just don’t hold as much appeal. That’s when I turn to something simple and delicious like this skillet meal! I seriously have been making this meal since I learned how to cook. It’s a staple around here! But don’t think for a minute that I’m done with Christmas cookies, either. 🙂 Thanks, Ben!! Love Santa-approved recipes. It is nice to mix it up a bit over the festive season, I guess too many cookies aren’t good for us either 😉 My non-stick pan has seen better days and I was thinking the other day that I should buy a new one. The T-fal Color Luxe line sounds great, how amazing that it shows you when it has reached optimal cooking temperature and I love the fact that you can just stick it in the dishwasher. Have a nice weekend, my friend! I totally agree with you, Miriam! Santa-approved recipes are the best. But sometimes even Santa needs something besides cookies. (Don’t worry, he’ll be back on a cookie diet tomorrow!) So these T-fal nonstick pans are pretty awesome. I love that thermo spot that tells you when the pan is hot, and the pans cleaned up quite easily. A win-win if you ask me! Maybe Santa will bring you a new pan for Christmas! 🙂 Thanks so much, my friend! Yes! If you’re husband loves chicken, then give this recipe a shot, Puja. It’s flavorful and easy…and really, really tasty, too. Thanks so much, my friend!! There is no way I would want to wait until Christmas Eve to do ANY Christmas shopping David. No way, I know my limitations. I’m not a great person for dealing with crowds of people all trying to get last minute shopping done. In fact I try and get everything as pre-prepared as possible and I’d definitely be in for having a yummy dinner like this. 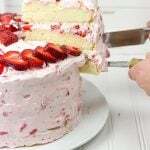 Thanks for this recipe, and have a great weekend! Tell me about it, Neil! I don’t understand how anyone can wait until Christmas Eve afternoon to finish their shopping. I don’t deal with crowds either, and the pressure of finding a gift on such short notice makes me break out into a cold sweat. No thank you! And thanks for the kind words on this recipe, my friend. 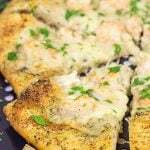 It really is one of the first recipes I ever made when I was learning to cook, and it’s still a staple on occasion around our house. 🙂 Enjoy the season, my friend! I could never wait until Christmas Eve to finish Christmas shopping. That would drive me crazy. I love this chicken broccoli and wild rice recipe sounds delicious. Sounds like something my family would enjoy. Tell me about it, Dawn…waiting until Christmas Eve to finish shopping would drive me bonkers! By Christmas Eve, I just want to be curled up on the couch waiting for Santa to arrive. 🙂 This skillet meal is super easy, and it’s perfect for the busy holiday season. Thanks so much for stopping by and commenting! I alllllmost have my shopping done. I can’t imagine waiting until the last minute!!! Eeeeeeek!! We have a big party at our home this weekend for family so lots of prep for that! Wanted to have most things done shopping wise so we could really focus on the party and enjoy ourselves. As much as I love cookies, I could eat this every.single.day. Bit of vinegar and sriracha and I’m one happy lady 🙂 Love the sliced almonds on there too! Same here! In fact, I think all of our shopping is done. We just have to finish wrapping it all. (It helps that my family lives far away. We have to mail everything which means we have to do it early or it won’t get there in time.) Sounds like you have a fun weekend coming up! I hope your Christmas party is a great time! 🙂 And if you need a quick and easy meal on these busy nights, remember this skillet…it really is one of the first recipes I learned how to make when I started cooking. Cheers, Dawn!! I still have some turkey stock left from my post thanksgiving stock fest. I think I’ll use it to make this dish.